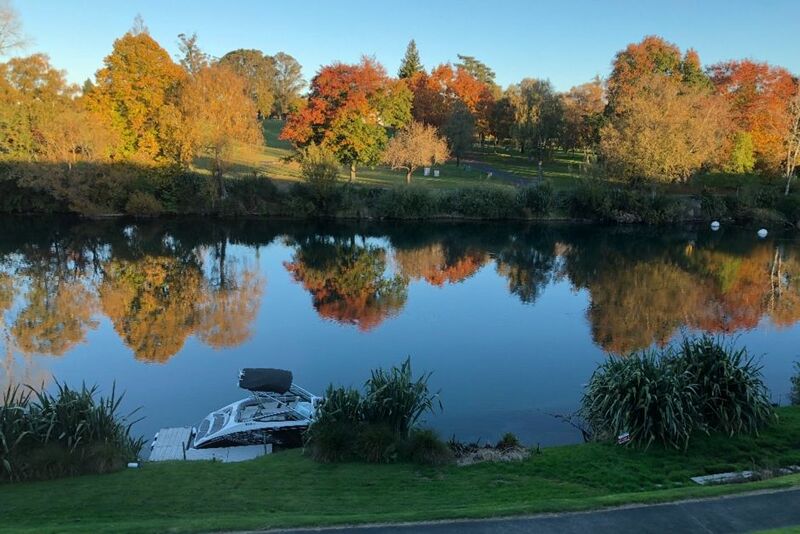 This apartment is the perfect base for your family vacation in Taupo. Spread over three levels, each floor has its own bedroom and full bathroom. The ground floor opens directly onto the banks of the Waikato River with sheltered outdoor seating, perfect on a hot day but not so good for a turbo charged toddler! The top floors provide stunning views of the Taupo Marina and riverside parks. This high-end apartment has open plan living and dining area with a fully equipped designer kitchen and separate laundry area with quality Miele appliances. There is underfloor heating in the bathrooms and kitchen along with heat pumps to keep everyone warm in winter. It is also one of the few apartments in Watermark that is double glazed for peace and quiet as well as insulation. Staying at this apartment gives you full access to the bespoke swimming pool and BBQ area. The pool is heated from Labour Day through to Easter Weekend. Linen is not provided but you are welcome to bring your own or hire from us for $15 per person. There are car parks within the complex to be shared and availability cannot be guaranteed. Trailers, camper-vans and caravans are strictly prohibited. Shared pool facilities, pool is heated over summer months only. Such a beautiful place over looking the river. Such a beautiful place over looking the river. Very spacious, modern and was great having our own bathrooms on each level. The owners even left a note saying we could help ourselves to food on one of their shelves. Perfect location and would highly recommend to others!